Tanjore paintings are one of the most popular forms of classical South Indian Paintings. This native art form comes from Thanjavur (also known as Tanjore), a city of Tamil Nadu. It was the 16th century when the supremacy of Marathas originated Tanjore paintings also known as Thanjavur paintings. Unlike other Indian Paintings, Tanjore paintings follow a different and unique pattern. Today, a few dedicated artists mostly based in Tamil Nadu have kept this tradition alive. The dense composition, rich surface, and vibrant colours distinguish Tanjore paintings from another present form of Indian paintings. A typical Tanjore painting has a common theme divulging child Krishna and his various pranks. The painting consists of a deity as the main figure with almond-shaped eyes and a well-rounded body. A gem-set or glided technique is used to highlight certain aspects of the paintings like dresses, ornaments, etc. and sparkling stones and gold leaves are used. The paintings are colourful, bright and breathtakingly appealing. It can become a centre of attraction in any of your room because it glows in the dark. 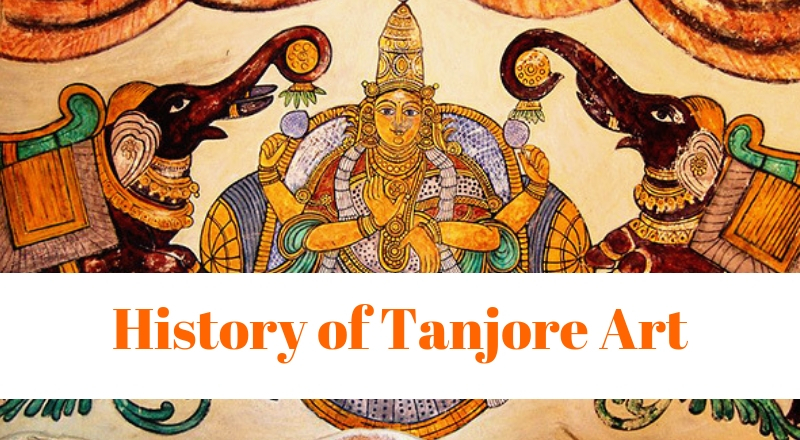 Over the years, the Tanjore paintings have undergone various changes. Though the style has changed, the technique remains the same. The reflection of Tanjore paintings lasts forever. These paintings are named after a southern state of India which is Thanjavur in Tamil Nadu. The city is pronounced as Tanjore in English and so paintings are known as Tanjore Paintings. The Thanjavur district is famous for its stunning art and architecture. And among all the Indian paintings, Tanjore paintings are considered as the most popular form of paintings. The Maratha rule of Thanjavur started this stunning art form. Under the incumbency of the Nayak and Maratha princess, the Tanjore paintings flourished. The two major communities which practised this art form were the Naidus from Madurai and the Rajus from Thanjavur. Materials like glass, wood, and mica, as well as some unusual mediums like murals, ivory and manuscripts, were used for the paintings. In the late centuries, the paintings were embedded with the real rubies, diamonds and other precious stones. But with the evolution of time, artificial and semi-precious stones gained popularity and got into the rage. The very first and basic step involved in the making of stunning and beautiful Tanjore paintings is the drawing of the preliminary sketch of the image of the base. The base is made from a piece of cloth, pasted over a wooden base. Further, the base is covered with a paste mixed up with zinc oxide and water-soluble adhesive. After the applying the paste on the wooden base, the drawing is made and ornamented with cut glass, pearls, and semi-precious stones. Laces and threads are also used to decorate the paintings. The thin sheets of gold are pasted on some part of the paintings, while the other parts are painted with bright colours to enhance the effect. Slowly and gradually, Tanjore painting is becoming famous all over the world. They have a rich and aesthetic appeal that can attract anyone. As the theme of this painting is very spiritual so they give peace to the person who owns these paintings and to those who make them. It has even become a motivational therapy for peace of mind. They can surely give a rest to your soul from the hectic schedules that one face in his daily life. No matter that with time Tanjore paintings have evolved but the purity and its natural and native beauty are still present in these paintings. During festive seasons of South India, many people use these paintings to gift their loved ones as souvenirs. They are largely used to change the environment of the offices or homes. Markets have the extensive range of Tanjore painting with different sizes and different prices to add beauty in your homes and to fit your budget. These paintings have also become so popular because they are suitable for every corner of the home. Their spiritual theme makes them perfect for every corner of the home. This time get a Tanjore painting for your home and spread the fragrance of spirituality around you!